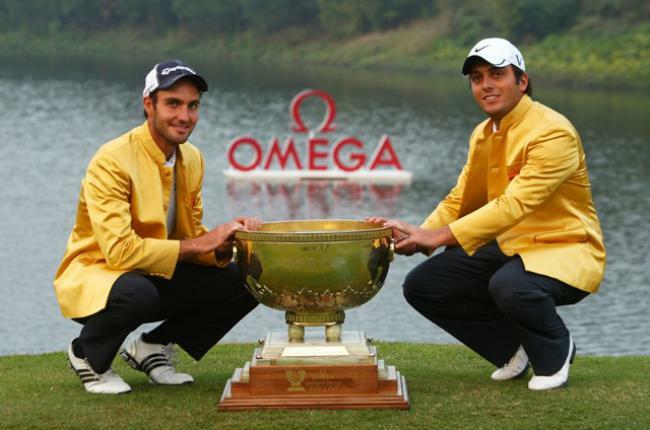 Italy’s defending champions, Edoardo and Francesco Molinari, will face some stiff competition not only to retain the Omega Mission Hills World Cup in November, but also for the honour of being golf’s leading brothers, with Columbia and Portugal both represented by siblings in China. Camilo and Manuel Villegas will form the Colombian challenge for the prestigious title at Mission Hills Resort, Hainan Island, China, from November 24-27, while Ricardo and Hugo Santos will be hoping to capture a first World Cup for Portugal. The three sets of brothers are among 28 teams of two players representing their countries, with five Major Champions – including current Masters Tournament winner Charl Schwartzel of South Africa and US Open Champion Rory McIlroy of Ireland – also in the field. They will all be trying to succeed the Molinari brothers who became the first brother combination to win the Omega Mission Hills World Cup in 2009 when they finished one stroke clear of Ireland’s Graeme McDowell and Rory McIlroy and Sweden, represented by Robert Karlsson and Henrik Stenson. Camilo Villegas will be making his second appearance at the World Cup, having finished T14 with Manuel Merizalde in 2006. His brother Manuel will be playing the event for the first time, as the pair attempt to follow in the footsteps of the Molinaris. "It will be a thrill to be able to play as a team with my brother, Manny," said Camilo. "We both want to go to China in November to make our country, and our family, proud." Similarly Ricardo Santos, who is currently third on the European Challenge Tour Rankings, has made one World Cup appearance in 2008, finishing tied for 13 th with partner Tiago Cruz.